After all this talk about the move tool and the Ctrl key, you may be wondering what happens if you drag a selection with the marquee, lasso, or wand. The answer is, you move the selection outline independently of the image. This technique, which I used earlier in this chapter in the steps "Removing an Element from an Image," serves as yet another means to manipulate inaccurate selection outlines. 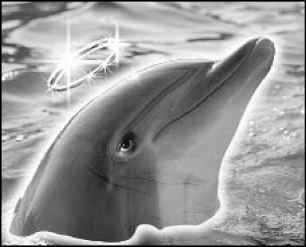 It also enables you to mimic one portion of an image inside another portion of the image or inside a completely different image window. 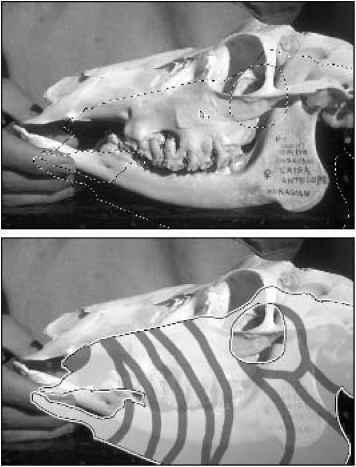 In the top image in Figure 8-22, I used the marquee tool to drag the skull outline down and to the right, so that it only partially overlapped the skull. I then lightened the new selection, applied a few strokes to set it off from its background, and gave it stripes, as shown in the bottom image. For all I know, this is exactly what a female Russian Saiga antelope looks like. Tip You can nudge a selection outline independently of its contents by pressing an arrow key when a selection tool is active. Press Shift with an arrow key to move the y outline in 10 pixel increments. For even more selection fun, you can drag-and-drop empty selection outlines between images. Just drag the outline from one image and drop it into another, as demonstrated in the first example of Figure 8-21. The only difference is that only the selection outline gets cloned; the pixels remain behind. This is a great way to copy pixels back and forth between images. You can set up an exact selection outline in Image A, drag it into Image B with the marquee tool, move it over the pixels you want to clone, and Ctrl-drag-and-drop the selection back into Image A. This is slick as hair grease, I'm telling you. So remember: The selection tools affect the selection outline only. The selection tools never affect the pixels themselves; that's the move tool's job. Figure 8-22: Drag a selection with a selection tool to move the outline independently of its image (top). Wherever you drag the selection outline becomes the new selection (bottom).